Acrylic paint is a great medium for beginners because it is relatively inexpensive, water-soluble, quick-drying, versatile, and forgiving. If you are not happy with an area you've painted, you can let it dry and paint right over it in a matter of minutes. Because acrylic is a plastic polymer, you can paint on any surface as long as it doesn't contain wax or oil. Unlike oils, acrylics can be used without any toxic solvents and can be cleaned up easily with soap and water. 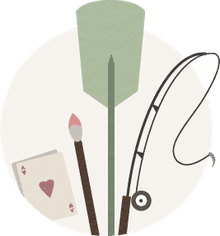 Learn the tricks of the trade, and you can soon embrace your inner Leonardo da Vinci, Vincent van Gogh, or Rembrandt using a forgiving medium these artists never knew when they created their great works. Many companies make acrylic paints in a fluid or liquid version as well as with a paste- or butter-like consistency. Artists will have a preferred brand based on aspects such as the colors available and the consistency of the paint. Check the of lightfastness of the pigment by looking for the American Society for Testing and Materials rating on the tube. You don't need to buy a box of 64 different colors, though, as unlike the crayons you had as a kid, paints can be mixed for infinite varieties of results. You can start off with 10–12 basic colors and mix shades from there. You could start with even fewer, really, as long as you have some primary colors, white, black, and brown. You’ll need stiff-bristled brushes for thick acrylic paint and soft-bristled brushes for watercolor effects. You’ll be faced with an array of sizes and shapes (round, flat, pointed), and you also get different lengths of handle. If you’re on a tight budget, start with a small and a medium-sized filbert (a flat, pointed brush). Filberts are a good choice because if you use just the tip, you get a narrow brush mark, and if you push down, you get a broad one. A good medium-sized flat brush will also come in handy. Depending on which edge you paint with, it can give you either a broader or thinner stroke. It will give you a more distinct brushstroke than a filbert brush. Modern synthetic brushes can be of excellent quality, so don’t restrict your selection to only those brushes made from natural hairs such as sable. Look for brushes where the hairs quickly spring back up when you bend them. With brushes, you tend to get what you pay for, so the cheaper it is, the more likely the hairs are to fall out. Variety packs will often contain a detail brush, a filbert, a medium-sized flat, and a 1-inch flat for prepping large areas. Other supplies that can be useful include round brushes for drybrush stippling/pouncing (such as in painting fur and texture) and a stylus for placing perfect tiny round dots or transferring drawn designs to a surface with transfer or graphite paper, but you don't necessarily need these materials at the start. Suitable supports for acrylics include canvas, canvas boards, wood panels, and paper. Basically, anything to which acrylic paint will stick—test if you’re not sure. If you’re buying a premade canvas or board, check that it’s been primed with something suitable for acrylics (most are). Wooden, glass, or plastic palettes can be used for acrylics, but it can be tiresome getting all the dried paint off. Disposable palettes—pads of paper where you tear off the top sheet and throw it away—solve this problem. If you find the paint dries out too fast, try a palette designed to keep the paint wet. The paint sits on a sheet of wax paper placed on top of a damp piece of watercolor paper. One of the pitfalls for beginning painters can be that while they are working slowly and carefully on their painting, the acrylic paint on their palette is drying. When they go to reload their brush with paint, they discover that it has become unworkable, requiring that they mix the color again, which can be challenging. To avoid this, paint the largest shapes of your composition first, and work quickly, with the largest brush you can, for as long as possible. Save the details and smaller brushes for the end. Work from the general to the specific. This will also help keep your painting from becoming too tight. Have a plant mister on hand to spray the colors on your palette to keep them from drying out as you work. You can also spray water directly onto your canvas or paper to keep the paint workable and for different painting effects, such as drips and smears. You can also extend their drying time by mixing the colors with the medium aptly called extender, such as Liquitex Slo-Dri Blending Medium. Acrylic paint colors tend to dry darker than they are when wet, particularly with inexpensive paints, which have a higher ratio of binder to pigment. When this occurs, apply several successively lighter layers of paint to achieve the desired color. This layering often enhances the painting, adding complexity and richness to the color. Student-grade paints also tend to be more transparent. To counter this, add a tiny bit of titanium white to the color or a tiny bit of white gesso, a paint-like substance similar to acrylic but thinner. This lightens (tint) the color a little bit and gives you the opacity you're after. You can also add a color that is similar but more opaque to one that is more transparent, such cadmium yellow to transparent yellow. If you are trying to cover an underlying layer completely, paint over it with gesso or a medium gray before applying the next color. Don't overload your brushes as you paint—multiple thinner layers build better color than thick globs—and keep or wipe away heavy amounts from the ferrule, as it's tough to get out if it dries there. Paint dried in the ferrule area can ruin your brushes. 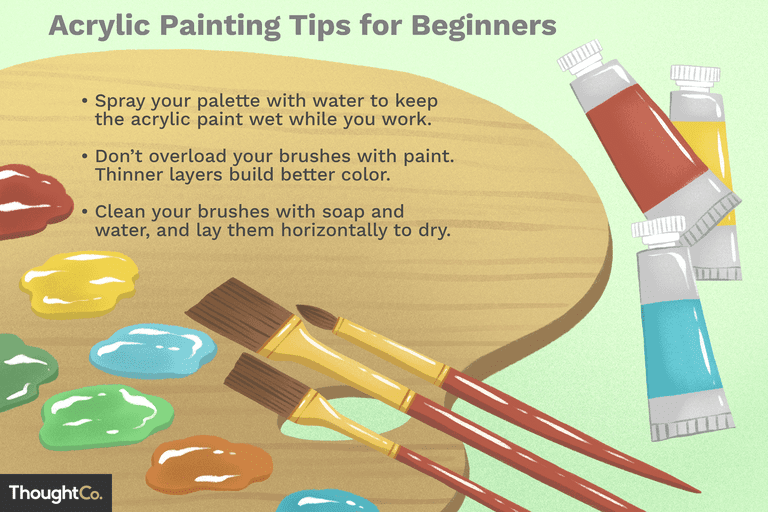 Keep your brushes in water while you're painting so that the paint doesn't dry in them. Use a container with a shallow layer of water to keep the brushes wet without soaking the handles (which will cause the lacquer to peel off) and another container to clean the brushes between colors. When you are done painting, clean the brushes with soap and water right away, making sure to get all the way back to the base of the bristles; rinse and dry them well; and lay them flat. Store them lying down or standing up on end with the bristles in the air. Do not dry them standing up. Place them that way only after they're completely dry. And don't store them bristles down, ever. There are a variety of mediums and techniques to increase the versatility of acrylic paints. Thin acrylic paint with a water or glazing medium to produce watercolor-like effects such as washes and glazes. You can also brush on acrylic paints thickly, alone or with a gel medium, for impasto effects similar to those of oil paint. Acrylic dries into an insoluble, water-resistant flexible paint film. This means that, unlike watercolor paint, which is water-soluble even when dry, you can paint on top of previous layers of acrylic paint without fear of lifting the color beneath. Save money by purchasing good-quality household decorating brushes. Look for brushes that aren’t too thick, or cut off half of the hairs. Acrylic is ideal for mixed media and collage. The paint acts as an adhesive and dries clear. It also makes a good surface for drawing on with graphite, oil pastel, and oil sticks. Use acrylics for painting studies of your subject outdoors. When dry, this water-resistant paint won't be ruined if you happen to get caught in the rain. Because of its quick drying time and chemical properties, it is also very useful as an underpainting for oil painting. You can work out many of the color and composition issues of your painting using fast-drying acrylics before committing yourself to oils. Just remember that you can paint oil over acrylic but not vice versa.